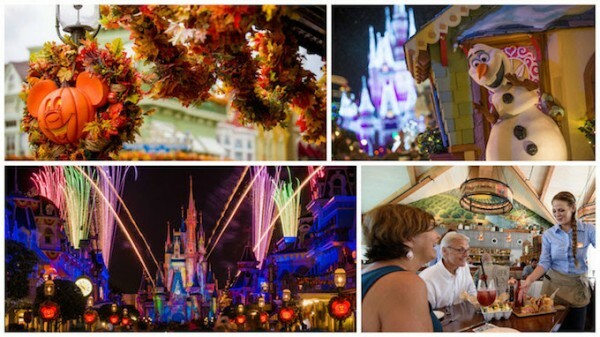 Fall is just around the corner and with it comes some great reasons to visit the Walt Disney World® Resort! From exciting new attractions and never-before-seen entertainment to the return of Guest-favorite annual celebrations and fabulous flavors, there’s something for everyone. Here’s a quick look at what is waiting for you beginning this September. Earlier this summer, Magic Kingdom® Park welcomed “Mickey’s Royal Friendship Faire” stage show; while Epcot® debuted Frozen Ever After and Soarin’ Around the World, as well as the new character greeting location, Royal Sommerhus. And, over at Disney’s Hollywood Studios®, the brand-new “Star Wars: A Galactic Spectacular” lights up the night. Brand-new eateries Frontera Cocina and Homecoming just opened their doors, as well as new retailers like Uniqlo, Vince Camuto, LACOSTE, Free People and Sugarboo & Co. Levi’s Store and others are set to open later this summer and Paddlefish will open late fall. This Guest-favorite offering returns to Magic Kingdom® Park on select nights, beginning Sept. 2, 2016. The hard-ticket event celebrates Halloween with trick-or-treating, Disney Characters in costume, the “Boo To You” parade, “Happy HalloWishes” fireworks and more. On Friday and Saturday nights from Sept. 2-Oct. 29, 2016 (and also on Oct. 31, 2016), Sunset Showcase will host “Club Villain,” a special ticketed event filled with fabulous performances, delicious food, bewitching cocktails and enchanting encounters with some legendary Disney villains. Two “Club Villain” experiences will be held each Friday and Saturday night, with starting times at 5:15 and 8:30 p.m. Reservations can be made by calling 407-WDW-DINE. Disney’s popular Night of Joy Christian music event will be held for the first time ever at ESPN Wide World of Sports Complex Sept. 9-10, 2016. The lineup this year will feature MercyMe, Casting Crowns, Chris Tomlin and more. This annual food and beverage celebration runs Sept. 14-Nov.14, 2016 and features culinary events, celebrity chefs, seminars, musical acts and more. The popular hard-ticket offering returns to Magic Kingdom Park on Nov. 7, 2016 and will be held on select nights throughout the holiday season. You can celebrate the season with amazing decor, a holiday parade and fireworks – and a brand new stage show this year! This seasonal celebration at Epcot returns to the park Nov. 25-Dec. 30, 2016. During this time, World Showcase comes alive with holiday cheer as each pavilion celebrates their culture and holiday customs. “The Candlelight Processional” show returns to the America Gardens Theatre to offer up holiday music and choirs, as well as a reading of traditional scripture by a celebrity narrator. Walt Disney World Resort’s first-ever Muppet-themed restaurant will open its doors this fall to serve up pizza in the Muppets Courtyard at Disney’s Hollywood Studios®. Are you ready to plan a vacation to Walt Disney World this fall? This entry was posted on August 19, 2016 at 3:03 pm and is filed under Disney Vacation Planning, Walt Disney World. You can follow any responses to this entry through the RSS 2.0 feed. You can leave a response or trackback from your own site.